Dr. Leroy Dubeck is a chess master and a chess politician. He is a Professor of Physics for College of Science and Technology and holds a Ph.D. in Physics from Rutgers University. He has served on dozens of senate, college and departmental committees including 15 years on the Faculty Senate Budget Review Committee, three years on the former Faculty Senate Research and Study Leaves Committee and served on the University Study Leaves Committee. He is the recipient of the Stauffer Award for service to Temple University. He has been twice acting chair of the Physics Department and former Chair of the Collegial Assembly of Temple’s College of Science and Technology. He is the author/co-author of 6 college textbooks and has been active in curricular improvements in science courses. He developed and teaches the only completely online course offered by the Physics Department. He has been the recipient of more than 20 grants, mostly from the National Science Foundation. At chess, he plays the Morra Gambit. He is rated 2324 by FIDE. 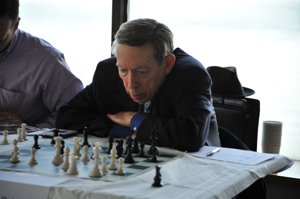 In addition to his activities as a gambiteer, he is also a life member of the United States Chess Federation , and a former chair of USCF’s Life Members Assets Committee, President of the U.S. Chess Federation from 1969 to 1972. Dr. Dubeck was instrumental in bringing Bobby Fischer to the Board to play his match for the World Chess Championship against Boris Spassky, although the match took place after his term of office was over.